Afghan officials and insurgent sources say the Taliban has captured a remote district in the northeastern province of Badakhshan. This is the second time during this year’s fighting that insurgents have overrun the embattled Yamgan district. A spokesman for the provincial police told local media Thursday that Afghan security forces have staged a "tactical" retreat and taken positions in surrounding villages, awaiting reinforcements for a counteroffensive to retake the area. Afghan media, however, quote defense ministry officials as saying bad weather hampered attempts to urgently airlift reinforcements to the conflict zone. A Taliban spokesman says the fighting for control of Yamgan left 14 Afghan security forces and six insurgent fighters dead. Despite the onset of a harsh winter, the Taliban has not halted its attacks and reportedly has engaged Afghan security forces in fighting in more than a dozen provinces. FILE - An Afghan soldier raises his hands as a victory sign, in Kunduz city, Oct. 2, 2015. 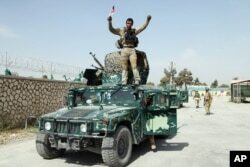 In late September, the insurgents briefly seized control of the key northern city of Kunduz, dealing a blow to U.S.-trained Afghan forces who are fighting the Taliban on their own for the first time following the withdrawal of NATO-led combat troops late last year. Meanwhile, officials in southern Kandahar province say a suicide car bombing targeting a government compound killed one Afghan soldier and wounded seven people, including three civilians. A provincial spokesman said the attack took place Thursday morning at a security checkpoint in Arghandab district. He added that one of the five attackers blew up the car while others tried to enter the district governor’s compound, but were killed by Afghan security forces in the process.